Q We rip a long, narrow stile (about 72 x 3 in.) and then send it to the moulder for profiling. We test for proper MC and casehardening stress. However, more than 50% of the pieces have 3/16 in. lengthwise bow, just after moulding or a day or two later. What are we are doing wrong? A Consider your stress tests. Transverse (or across the grain) casehardening stress is measured using a prong-test where the legs or prongs (cut about 6 in. long and one-quarter the thickness of the lumber) should be parallel with each other or nearly parallel. If there is transverse stress, the prongs will bend inward and lumber pieces will cup when machining. Lengthwise warp is a different stress and will not show up using the prong test. Instead, I suggest that you cut a 24 in. long piece of wood from a piece of lumber about 8 in. wide. Then rip this piece into two 4 in. wide pieces. Put the two ripped pieces back together and they should fit with any gaps being less than the thickness of a dollar bill. Wood will bow, as in your case, more if the grain is not perfectly parallel to the sides of the piece. When making narrow long products from wood it would be best if the sawmill sawed the lumber parallel to the bark and did not use crooked logs. 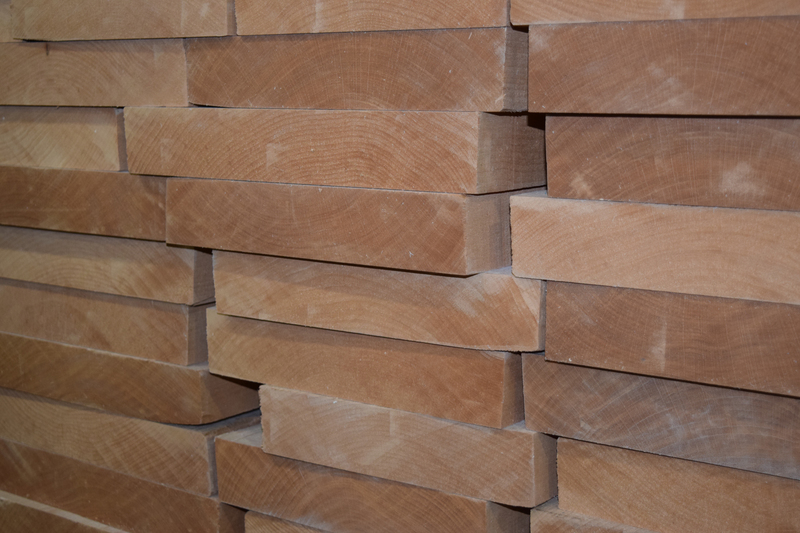 Q I have some lumber that is cupped quite a bit after it has been kiln dried. Is there a way to flatten this lumber by putting water on one face? A Flattening cupped lumber is almost impossible to do. The best chance at flattening can be achieved by quickly rewetting the convex side. Use hot water. It will try to expand, but it cannot do so. As a result, it will develop what is called compression set. Do not let water go beyond the surface (maybe 1/4 inch) on this convex side. In other words, do not wet for more than an hour at most. Remove the water and then let this convex side dry. As this side dries, it will shrink and hopefully the amount of shrinkage will be enough to result in a flat piece. The problem with this technique is that it is hit or miss as far as how much water to add. Further, flatness is not permanent; the piece will cup if rewetted. An alternative method is to steam the piece, getting it “soaking wet” throughout as well as hot. Then bend it flat and dry it while holding it flat. This again is not totally permanent and is hard to do. Q When I plane lumber, I am getting a significant wavy surface, which takes a lot of sanding to get smooth. We also are seeing some chatter with narrow pieces. Why? A For waves, my first guess is that you have one knife that is protruding further out of the head than the other knives. So, the surface you are seeing is basically a one-knife surface. This can be determined by measuring the distance between each ridge and comparing the measurement with the calculated distance as if each knife is working equally. This calculated distance is: D = (12 * F)/(T * N), where D = calculated distance between ridges in inches; F = feed speed in feet per minute; T = number of knives per head; N = head speed in rpm; and R = the radius (1/2 the diameter) of the head including the projection distance of the knives (the 12 in the formula is to convert the feed speed into inches per minute.). One way to obtain equal projection for all the knives is to joint the knives after they are installed. If jointing does not fix the problem, then you likely have a bearing problem. For chatter, if you see problems planing narrow pieces, I suspect the flat bed plate is worn in the middle. Wide pieces are held firmly by the edges of the bed plate, but the wear in the middle means narrow pieces are free to move up and down. If you feed a narrow piece to the left or right edge, will it be OK? If so, that confirms my diagnosis. You could also have a pressure bar that’s worn or chip breakers that aren’t set correctly. Q What are some other planing defects and how do I prevent them? A Defects such as ripples, raised grain, snipe and fuzzy grain can ruin your project. Here are some simple solutions. Ripples: There are three basic causes for this to occur. First is that feed speed is too fast. The second cause of ripples is that the bed plate of the planer is no longer flat. A third potential cause will happen when the knives are dull and push some of the wood down into the lumber face rather than plane it off. Raised grain: This will only occur with woods that have a large density difference within an individual annual growth ring. It results when the knife pushes the dense latewood into the soft earlywood, instead of cutting the wood fibers. The cure is to take smaller cuts and use sharper knives. Snipe: This happens when the lumber is not held tightly against the planer’s bed plate, but lifts and is pushed into the planer knives. The solution is simple. 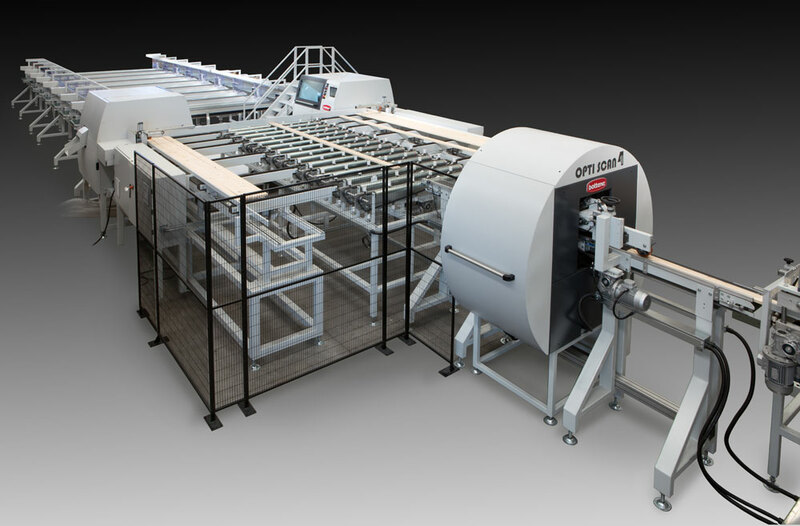 For a top-head machine, the infeed and outfeed tables where they connect to the machine must be exactly level with the bed plate. Then, further from the machine, the tables must go up a few thousandths of an inch higher than the bed plate of the machine for every foot of length. The table must also be long enough to hold the full length of the lumber. For a bottom-head machine, the slope would go the other direction. Fuzzy grain: This results because the wood fibers are too weak to be cut cleanly, so they fold over. With the addition of moisture, they pop back up and really look rough. Oftentimes the weak fiber results because of a growth defect called tension wood, which is found only in hardwoods. Weakness also results when the MC is high. Also, low-density species have weaker fibers, especially aspen and cottonwood. Slender, sharp knives (large rake angles) will help the situation. Often, in practice the cure is to use a sanding sealer or wash coat on the lumber after planing but before sanding. This treatment stands up the fibers and then holds them up so they can be sanded cleanly. Q Is there any kind of a chemical that can be used to detect the presence of antifungal dip in the loads that we receive? Currently, we require that our vendors dip their loads of white oak and red oak and we're running into stain issues. We'd like to know whether or not they are, so we can process the undipped ones first to preserve them and also to file complaints. 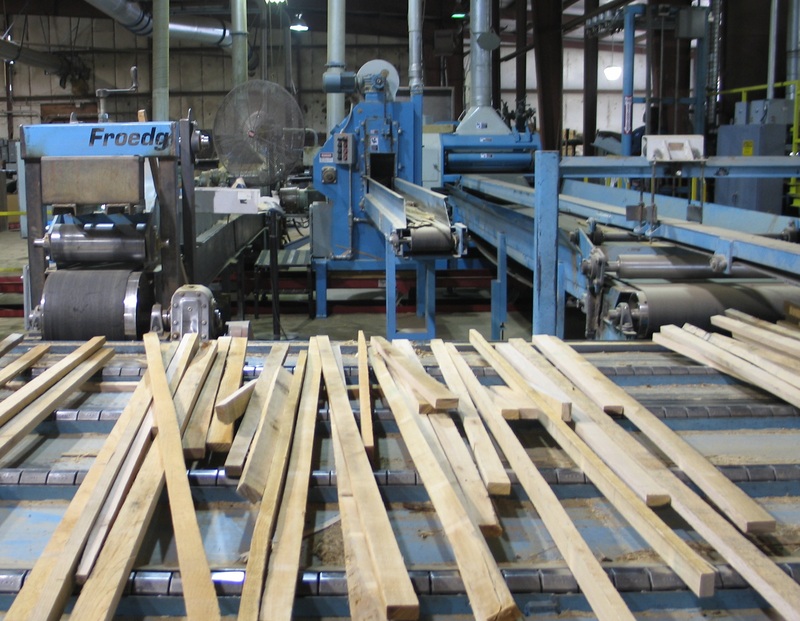 A The dipping process that you refer to is done to green lumber at the sawmill. The lumber is immersed briefly in a mixture of chemicals. Some of the chemicals remain on the lumber's surface and provide an insecticide and fungicide barrier on the lumber's surface to prevent new infestation. Each chemical dip will have a different test procedure, so when buying from several mills, it will be tough to test for dipping unless they're all using the same chemical for dipping. However, the dipping only prevents fungal stains. Most often in oak, the blue or grayish stain in the sapwood is caused by the enzymatic oxidation of sugars in the sap. Sometimes these are called gray stain, sap stain, oxidation stain, enzyme stain or chemical stain. Sticker stain or sticker shadow is in the same classification. So is pinking and browning in hard maple and a few other species. These stains can be bleached away, and some dips do have a bleaching effect on the lumber's surface, so the stain may only show up after planing. These stains begin to develop in the log while it's stored in warm weather, so old logs are much more likely to develop this stain in the lumber during drying. In warm weather, the stain can begin to develop within 24 hours. This makes it extremely hard to control. Years ago, this stain in gum lumber was prevented by steaming the lumber prior to drying. I've also recently seen a patented heating process that apparently deactivates the enzyme in fresh oak lumber and thereby prevents the stain. Why is our lumber yield decreasing?